One of the most popular shopping destinations in the Oklahoma City metro area, the OKC Outlets, which opened in August 2011, draw visitors from all over the region. The project was a result of a public infrastructure improvement with Horizon Group Properties, Inc., and was later expanded. Formerly known as the Outlet Shoppes at Oklahoma City, the complex was renamed OKC Outlets in 2017. The massive mall spans 348,000 square feet and cost $50 million to build. The exterior design is quite colorful and unique, with bright signage throughout and large white canopies covering walkways. Visitors will find a center court area for concerts and events as well as a children's play area and a food court. It is estimated that the OKC Outlets generate $120 million in annual retail sales and $4 million in annual sales tax revenues. Not only did it bring approximately 700 construction jobs and 1,000 permanent jobs, the outlet mall brings new shoppers to the metro area. 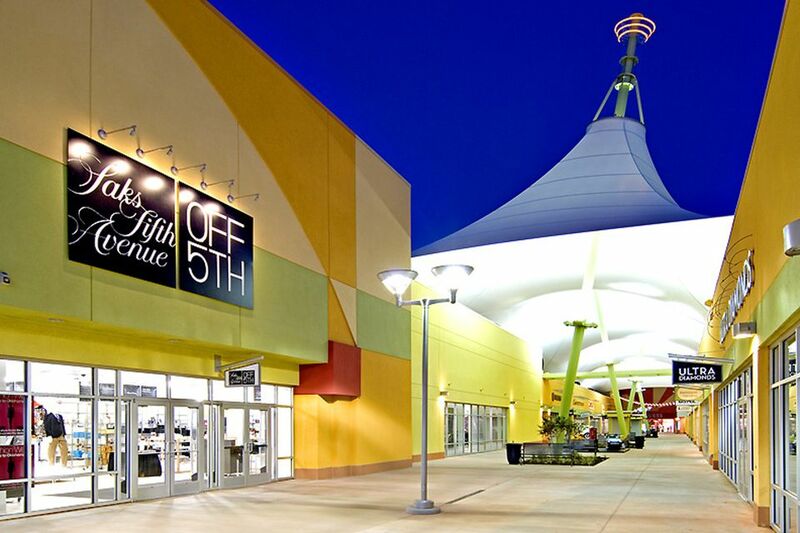 Before the mall opened on Aug. 5, 2011, the closest outlet mall to the metro is in Gainesville, Texas, 135 miles away. On grand opening weekend, for example, mall officials announced that over 160,000 people visited. Among the retailers are Nike, Brooks Brothers, Under Armour, Banana Republic, Gap, Guess, Chico's, Coach, Tommy Hilfiger, Disney Store, Michael Kors, Jos. A. Bank, Polo Ralph Lauren, Soma, Yankee Candle and many more. See a full list. The mall is located on the northeast corner of I-40 and Council Road on the west side of Oklahoma City. Look for exits 142 and 143. From I-44, take I-40 west. From I-240, go west to I-44 eastbound; then take I-40 west. From I-35 or I-235, take I-40 west. If you're traveling to Oklahoma City to visit the outlet mall, there are plenty of top hotel options nearby.